This CellML version of the model has been checked in COR and PCEnv and the model runs to replicate the results in the original published paper. The units have been checked and are consistent. This particular variant of the model simulates a continuous infusion of prolactin over a nine day period. When prolactin was first discovered it was identified exclusively as being a lactogenic hormone. However, since its initial discovery a wide range of biological functions have been assigned to prolactin, including water and electrolyte regulation, growth and development, metamorphosis, cell proliferation and differentiation, behaviour and immunoregulation. While the principal site of prolactin synthesis and secretion is the anterior pituitary gland, it is also produced locally by other tissues, including the skin. Prolactin binds to a transmembrane cell surface receptor which exists as multiple isoforms, generated from a single gene by alternative splicing. These receptors are expressed throughout the body in many different tissues, consistent with prolactin's diverse range of physiological roles. Prolactin binds sequentially two two receptors, via two binding sites of differing affinities, to produce a dimer complex. This then initiates an intracellular signal transduction pathway, usually via a kinase cascade. While ligand-mediated receptor down-regulation has been observed (negative feedback), in certain tissues prolactin is also able to up-regulate expression of its own receptor (positive feedback). Signalling mechanisms within the cell can regulate receptor expression at the transcriptional level, and feedback can also occur on a larger spatial scale via different endocrine mechanisms. In combination, these mechanisms of prolactin receptor regulation may be an important determinant of the nature of the responses of a target tissue to prolactin. In the paper described here, Soboleva et al. present a mathematical model of the prolactin-prolactin receptor signalling pathway (see figure below). Model simulations demonstrate that while prolactin receptor expression is insensitive to subcutaneous injections of prolactin, it does however respond to a prolonged infusion of prolactin. Under these latter conditions there is an initial acute period of receptor down-regulation followed by a prolonged period of up-regulation. 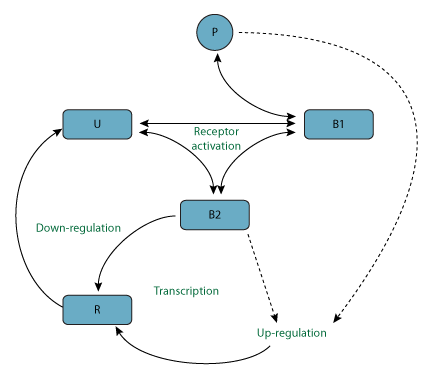 Schematic diagram of the reactions described by the prolactin-prolactin receptor signalling pathway model. U represents the unbound prolactin receptor on the surface of the cell, B1 is the bound receptor, B2 is the dimerised receptor, P represents prolactin in the plasma, and R is the mRNA for the prolactin receptor. Derived from workspace Soboleva, Vetharaniam, Nixon, Montenegro, Pearson, Sneyd, 2005 at changeset 48abf9ac0b82.